Left, Right and Center #22: Racism In Hiring? In this episode of Left, Right and Center, host Jim Chapman asks the panelists about a Statistics Canada report that states that the federal government is not hiring enough visible minorities. The panel talks about affirmative action. 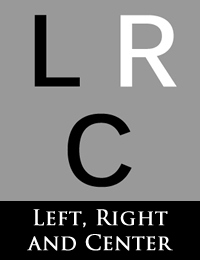 ABOUT LRC: Almost every week during the period September 10, 1997 through June 23, 2004, Freedom Party president Robert Metz participated in radio 1290 AM CJBK’s “Left, Right, and Center” program. Show host Jim Chapman represented the “center” viewpoint, and Metz occupied the “right” (which is not to say “right wing”) viewpoint. A range of London-area personalities represented the “left”, including Jeff Schlemmer and former Ontario Solicitor General Marion Boyd. When Metz could not be present, other Freedom Party personalities typically assumed the “right” viewpoint, including Robert Vaughan, Lloyd Walker, and Danielle Metz.